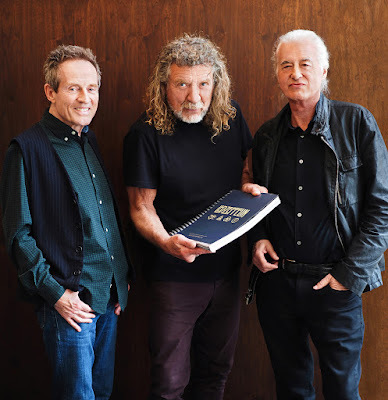 Led Zeppelin are sharing an update on their upcoming book, “Led Zeppelin By Led Zeppelin”, due this fall as part of the band’s 50th Anniversary celebrations. “Work on the official book ‘Led Zeppelin by Led Zeppelin’ is almost complete,” says the group in a new statement. “The images have been carefully selected and annotated throughout by Jimmy Page, Robert Plant and John Paul Jones. “Celebrating 50 years since the band's formation, it covers the group’s unparalleled musical career and features photographs of Led Zeppelin on and offstage from their very first moments together. This definitive 400-page volume includes previously unpublished photos, artwork from the Led Zeppelin archives and contributions from photographers around the world. The statement was accompanied by an image of Page, Plant and Jones photographed last month with their working draft of the book. Earlier this year, Page confirmed that Led Zeppelin will release a live album as part of the 50th Anniversary plans. Formed in London in 1968, Led Zeppelin have sold more than 300 million albums worldwide and were inducted into the Rock And Roll Hall Of Fame in 1995.